Aries, reaching and testing your limits, that is the horoscope's message for September 2018. But what that means? Whether by your own will or by unforeseen circumstances, you will test the limits of your own mental and physical endurance and capabilities. It may be a spectacular participation in the famous "Fort Boyard" competition. However, there is also the danger of a severe depression or failure that may be helpful like "a light rain in the floods". If anyone offers a helping hand to Aries in September, do not hesitate to accept it; even if you are reluctant to do so at any other time. Simplification, competition and building of bridges. These are the three important "movers" for Taurus during September 2018. The horoscope suggests that people born in Taurus should: 1) Show more effort to make things easier, rather than desperately trying to double the capacity of the diary in an hopeless effort to "blow up" the day to 48 hours. 2) Prepare also for the fact that competitiveness will rise sharply in September, at work as well as in love and relationships. 3) Taurus will strive to bring people together ("build bridges between the opposite banks / opinions") in September, to dampen conflicts and to understand the feelings of others (more empathy). The taste of Gemini will be outstanding in September. Also your aesthetic feeling may reach the absolute peak. You could immediately become the Editor-in-Chief of the Vogue magazine, or you could shine as the brightest star of Food or Gourmet magazines. In September Gemini will fall in love with the cute Japanese "kitty" design. The horoscope states that pink colour will suit Gemini and that Gemini may also feel a great need for love and tenderness. The 2018 September Horoscope tells Cancer that a period full of your biting remarks is very close. In other words, Cancer, your criticism, though well intended, does not symbolize the necessary "fertile soil" for flawless communication. In matters of love and relationship you may argue over the imaginary "crown and sceptre"; what, of course, is not the best way to achieve desired mental peace. At work, people born in Cancer will show that they regard own solution as a "perfect invention", at least in comparison to the often ridiculous efforts of others. The horoscope says that Cancer may feel like a real combine harvester that must take breath away of all the people walking around only with hoes. In September, Leo's desire will be the overall perfection. You are longing to look great on social networks, on photos, as well as in everyday reality. Perfect appearance and superb performance could this time serve as a complete synonym for this zodiac sign. At the same time, Leo's horoscope depicts you as a predatory pike that other weaker fishes should watch very carefully. If you have to choose between brake and gas pedal, the horoscope is sure that Leo will favour energy, assertiveness and the forward movement. What is it to feel like a slave? This question will surely touch Virgo's heart during September. You appreciate helping others, loving justice, admiring fair play or being precise at work. But September 2018 may question all of that. What if (at work, in marriage, love ...) are the "forces" not as balanced as you have been thinking? According to the horoscope, Virgo is likely to feel and realize the varying amount of energy you emit, and in turn, you get from the closest relationships is not equal or adequate. And this may, of course, notably affect the evaluation your priorities. Mission impossible - do you know the movie (Tom Cruise)? Don't worry, Libra, in September you will not find any hard, let alone impossible, mission. On the contrary, green checkmarks, which you like to make on completed tasks, will now grow like grass after a spring rain! Libra, the 2018 September Horoscope shows that an important centre of energy will be located in your head, in form of concentrated mind. Only the best ideas will emerge here; ideas having the chance to change the world for the better, and also here – on your head, tempting lips will lure your beloved counterpart. 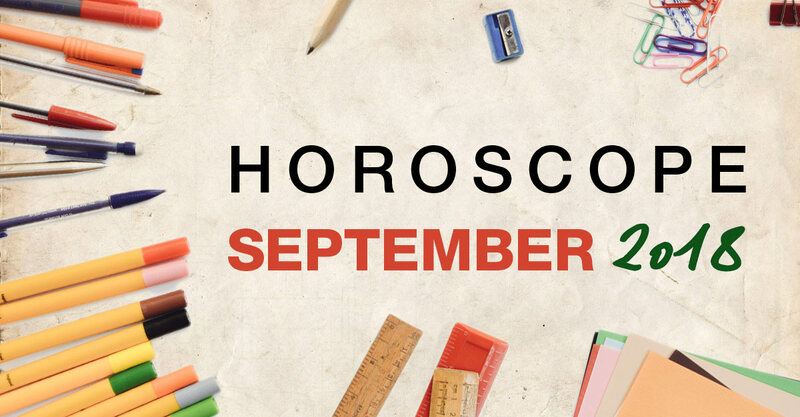 The horoscope tells Scorpio that September is the right time to stretch your wings and start to fly into the world. Scorpio, according to the horoscope, September will dominated by your ability to be guided by heart, rather than by rationality. There comes a time when it is more important how you feel and experience things, rather than if everything seems to be fine according to some abstract and logical plan. Saving, exact calculation and putting more pressure – Sagittarius, that's the main recommendation for successful September. You should definitely not support debt and large household spending this month. If your fridge gets broken, you certainly don't have to worry about the new one and buy what you want. But to buy a second Ferarri just for pleasure, that's not the best idea. At the same time, Sagittarius will start to have very "calculating" mind, what will allow you to outwit some old rival. The horoscope suggests, don't be shy and show others that you are self-confident person with sharp elbows. Capricorn should be alert in September. Fortune may show you the adverse side. But don’t panic. The horoscope suggests that it is better to be cautious now, because your luck is now very „vibrant” and unstable. If you forgot the name of your GP, it’s surely the right time to take a preventive medical checkup. Capricorn, whoever rides a bicycle should not forget take the helmet and the reserve tube. And Capricorn, above all, you should care about love more than about any wild rose. Aquarius will be an ideal advisor or an impartial judge in September. The horoscope highlights the ability of all people born in this sign to (figuratively speaking) "draw a map", according to which others can easily find the right path and solve many seemingly hopeless situations. The year 2018 has both sides, the dark one and the sunny one. But Aquarius will face only to the pleasant one during September!